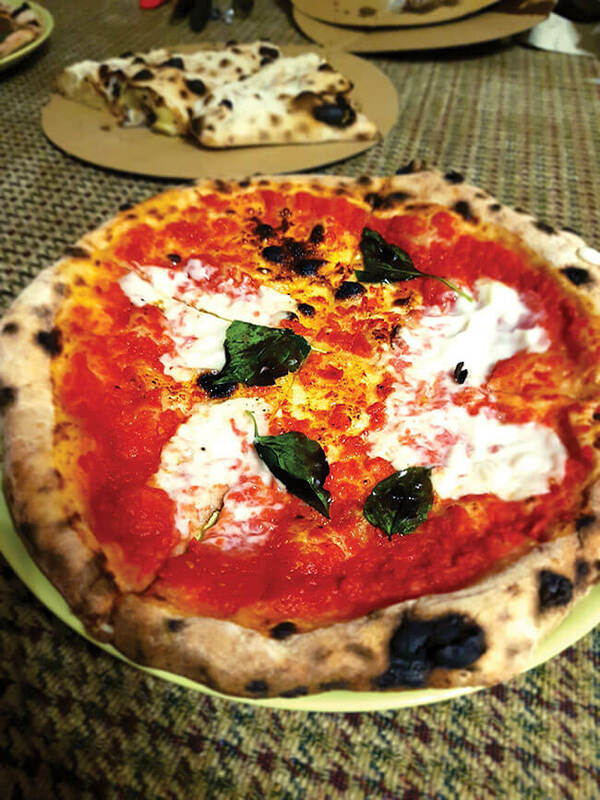 Vegazzi is a trailer-stand pizza place that is a little tucked away and situated in a “ruin bar”. It provided the perfect late night dinner, as it was moments away from the apartment my sister and I stayed in. Vegazzi only offers pizzas and calzones, but these are absolutely delicious. I had a mozzarella pizza and a cheese and potato calzone, both were lovely, but the pizza was especially delicious, and the rice cheese they use was scrummy. A great place to check out if you want a quick meal, or something to eat while visiting the bar. Naspolya Nassolda is a raw vegan café, which offers healthy, nourishing foods, without compromising on taste. 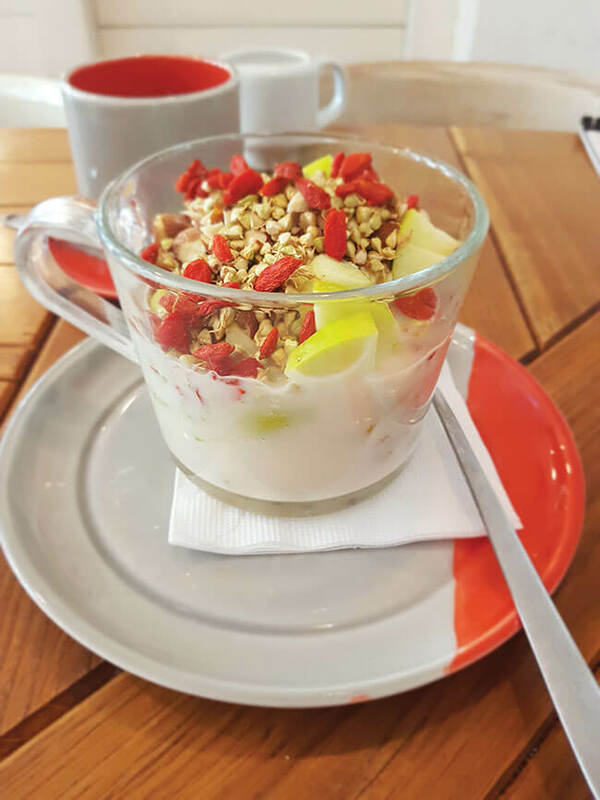 This was my first experience of a raw vegan café, and I was pleasantly surprised at how delicious the food was. For breakfast, I had the raw granola, with shredded coconut, cocoa nibs and banana, covered in freshly made almond milk. It was absolutely delicious, and has made me want to recreate it while at home. I also tried their fresh strawberry and mint juice – incredibly refreshing and delicious. I love the relaxing atmosphere of this place, and the décor is peaceful, modern and simplistic. I will definitely be coming here again on my next visit, and will hopefully check out more than just their breakfast menu. A must-try while here! 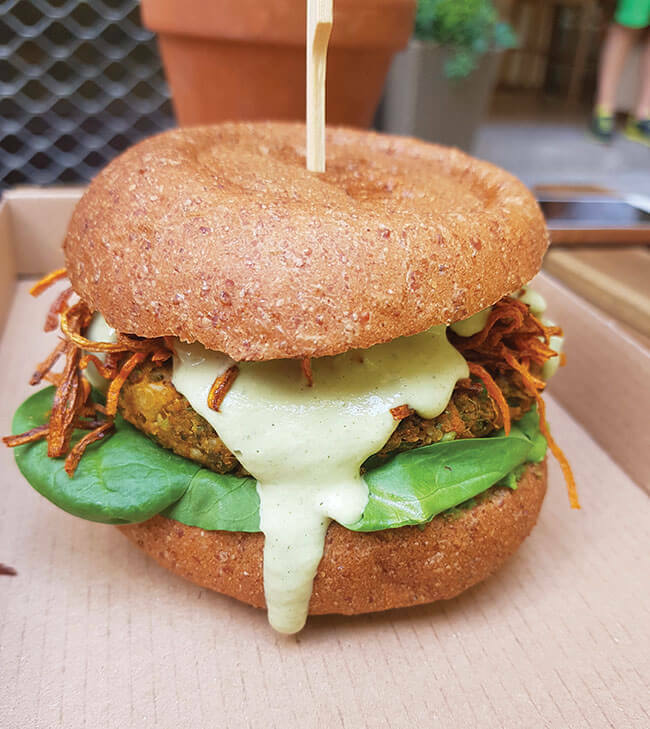 Vegan Street Food Garden is a courtyard that comprises of a bar serving vegan-only beverages, and numerous trailers that sell ice creams, cakes, cookies, kebabs, burgers and more. Seating is mainly outside, which is lovely during the warm, dry nights, but there is some uncovered seating in the bar area. I tried several of the burgers from the Las Vegans trailer, and my two favourites were the Forest Burger and the Indian Chickpea Burger – both so good! I also tried several cakes, which were all delicious. This place offers a great atmosphere, and is a great place to sit outside, relax with a drink and enjoy some delicious food. The staff were all incredibly friendly, and my sister and I returned here a couple of times during our stay. A 100% vegan bakery, Fill Good was a great lunch stop that offers several delicious savoury and sweet options. 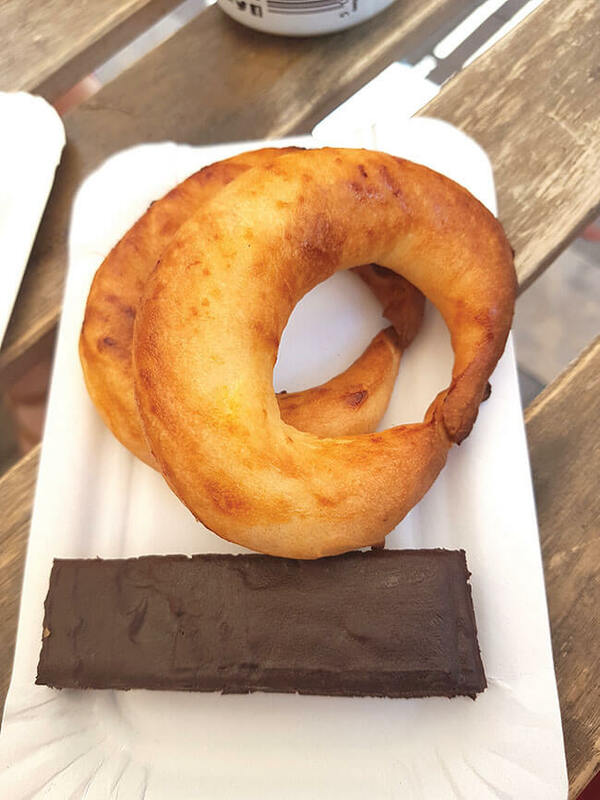 Many of the options are traditional Hungarian pastries that have been veganised, which gives you the opportunity to not be left out in trying the local cuisine. A couple of my favourites were the dough “fries”, the courgette pizza and the marzipan pastry. 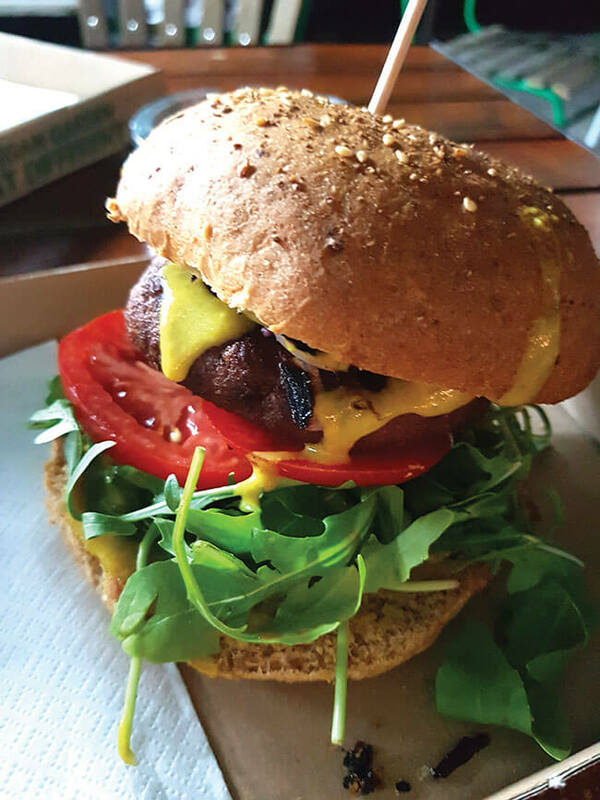 Only a couple of doors away from Fill Good Bakery, Tökmag Vegan Street Food is a small venue offering fast and convenient burgers, salads and sandwiches. Seating is provided outside, and the food was yummy and the service friendly. 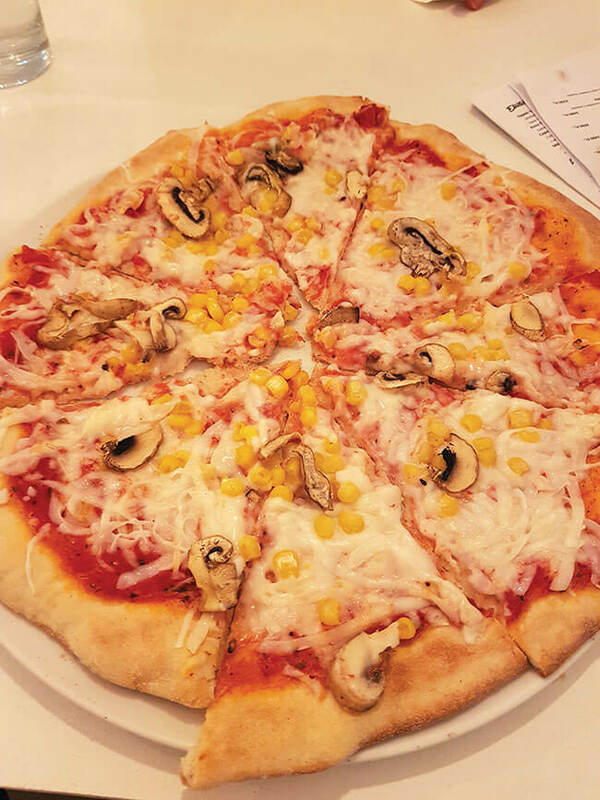 This bistro is a great spot that offers pastas, pizza, desserts, salads and much more. The staff are very friendly, and the food freshly made. It took quite a while for our food to arrive, but it was worth the wait; I had their (giant) potato wedges and pizza, and both were very filling and delicious – the crust on the pizza was perfect, and the vegan cheese wasn’t overbearing, and was delicious. Finding Gelarto Rosa in St. Stephen’s Basilica square was one of the highlights of my trip, not least because it was incredibly hot when I visited. Though the ice cream parlour is not completely vegan, the majority of their ice creams are suitable for vegans, and the staff are happy to point out which ones are suitable. These ice creams not only taste amazing, but they look incredible. 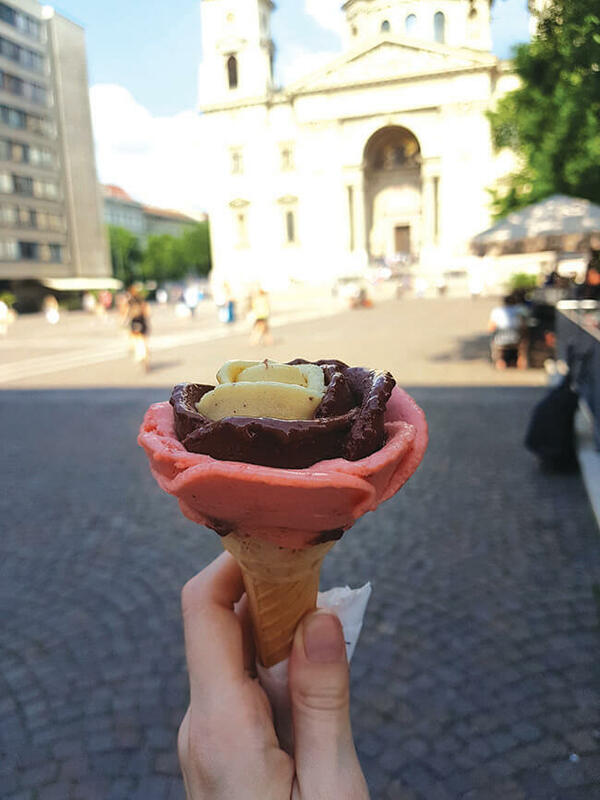 They are scooped into the cone – which is vegan too – in the shape of a rose. I had three flavours: strawberry rhubarb, chocolate raspberry and banana date; banana date was my favourite. Budapest is full of beauty and history, and you’ll definitely find yourself wanting to return to see more of it! Wherever you go, you’ll learn more about the rich heritage of the city and the stories and figures of the past. The atmosphere on both sides of the Danube buzzes with energy, and every turn offers new, exciting places to explore. 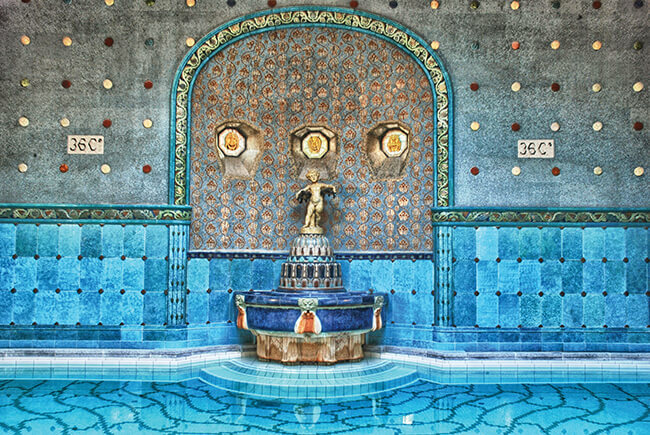 Budapest boasts one of the largest spa baths in Europe, with 15 indoor baths, three huge outdoor pools and a whole host of saunas, steam cabins and massages/treatments/aqua therapies to try. Why not explore the nearby area, too? The Szechenyi Palace and baths are situated in City Park, which is the biggest green park in Budapest and promises beautiful scenery. 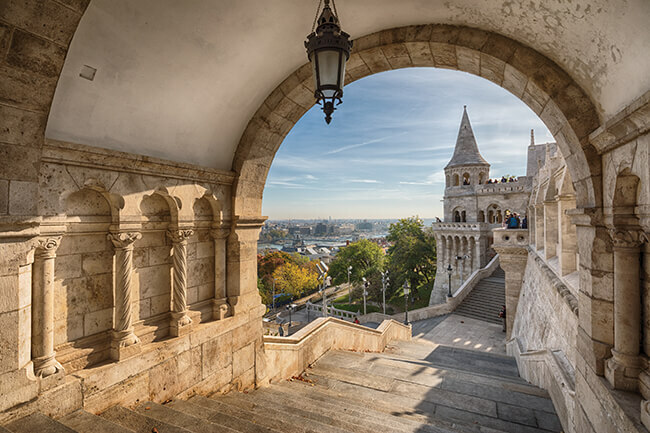 If you’re looking for the best panoramic views of Budapest, Fisherman’s Bastion in Buda is the place for you. The 19th century lookout towers are beautiful, and for a small fee you can walk the walls and look out over the city. This attraction is open all year round, all day, so you can return at night to watch the city light up. 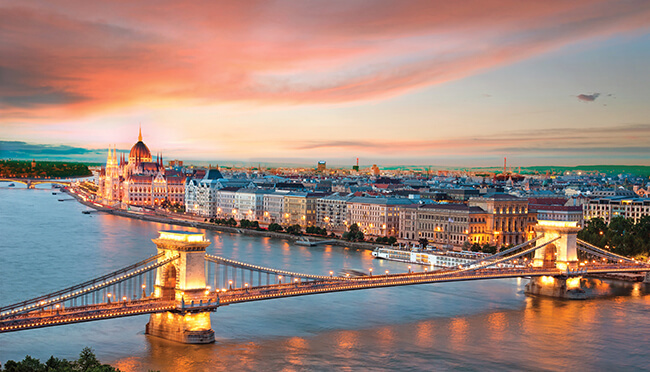 Bisecting the two sides of the city, the River Danube is at the heart of Budapest. A cruise along the river provides you with an unrivalled view of both hilly Buda and flat Pest. There are a multitude of cruises to choose from every day, often with entertainment or dining included as well. Typically, one of the cruises lasts between one and two hours. The largest – and arguably the most spectacular – square of the city was laid out in 1896 to celebrate the thousandth anniversary of Hungary. Hungary loves to celebrate its heroes, so this place is brimming with history and culture. Among the figures in Heroes’ Square are the Archangel Gabriel, the seven chieftains who led the Magyar tribes to Hungary, and a past Prime Minister, Imre Nagy. St Stephen’s is the largest church in Budapest, capable of holding a massive 8,500 people. Its patron saint is St Stephen, whose mummified hand is kept in a glass case in the chapel. The architecture is stunning, as are the views of the city from the basilica’s observation deck. 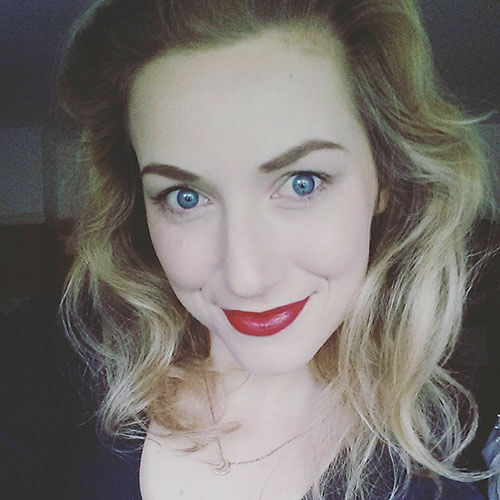 Alicia Griggs is passionate about animal advocacy, and uses her love of writing to encourage people to live a cruelty-free and vegan lifestyle. Alicia is the creator and writer of the blog True Beauty by Grigglet, which promotes and reviews cruelty-free and vegan items. She believes no product involving the exploitation of animals can be called a ‘beauty’ product, and that people need to extend their parameters of compassion.